The Springfield Revival open the show with a bouncy little number. They’re comprised of two white-suited gentleman strumming guitars and a lady in a blue dress shaking a tambourine for all she’s worth. 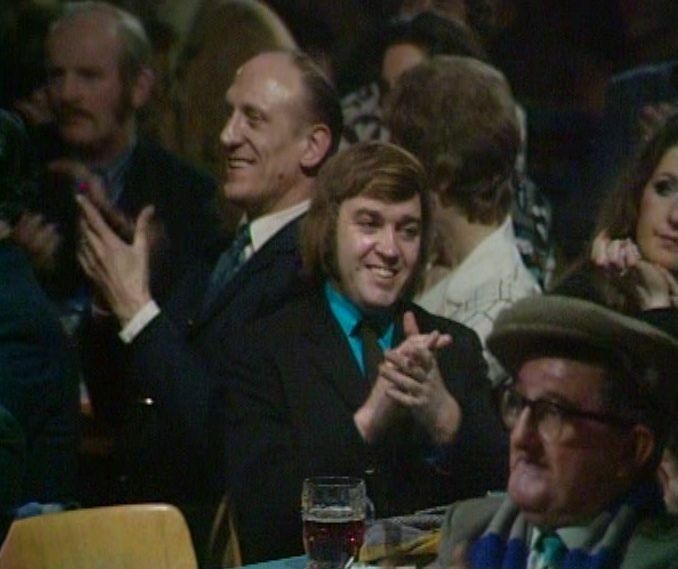 There’s the odd cutaway shot to the audience who seem a little unenthused (but possibly it was early and the alcohol hadn’t begun to kick in yet). But they do manage to engage the audience in a singalong after their main number which warms them up a bit. Tommy Cannon is introduced as a solo performer. He’s sporting an impressive brown suit complete with flares and a ruffled shirt. His sartorial eloquence somewhat detracts from his lusty attack on Summertime it has to be said. But Tommy’s moment in the spotlight doesn’t last long as an enthusiastic friend from the audience (Bobby, of course) can’t help but show his appreciation at Tommy’s star quality. This doesn’t go down well with some members of the audience, who cry out “sit down, you’re spoiling his act”. Did they really not twig that Bobby was the other half of the double act? But it doesn’t take long before Bobby’s cheeky-chappy persona (and no doubt his politically incorrect song about a house full of Pakistanis) has won them round, which enables Bobby to milk the audience’s sympathy after Tommy orders him offstage. You’d have been hard pushed from this spot to foresee that Cannon and Ball would go on to enjoy such a long run on ITV, but there’s clearly some spark there – even if their Wheeltappers debut is only fitfully amusing. Julia Rogers, a vision in a sparkly pink dress, has an impressive set of lungs which she uses to belt out a couple of songs. Best known for her 1964 hit The Wedding, she has something of a Shirley Bassey feel. Given this, it’s possibly not surprising that she had a close encounter with the James Bond world – recording a demo of You Only Live Twice (albeit a different song from the one later recorded by Nancy Sinatra). Upon Eric Delaney’s death in 2011, aged 87, many of his obituaries commented on his energetic stage persona. An inventive drummer – he pioneered the technique of playing the timpani with wire brushes – he’s good value during his short Wheeltappers appearance. The arrival of Tina Townsley gains some murmurs of approval from the audience. Are they appreciating her baton twirling skills, or is it more to do her brief costume? Hmm, I wonder. She gets the opportunity to prove that she can twirl other things too – such as knives – although the act doesn’t really go anywhere. She appears, twirls some objects and then departs. The Bachelors run through a medley of some of their greatest hits (Marie, Charmaine, Diane, Whispering). They then spotlight a number of songs which feature the banjo. And why not. By this point some members of the audience are warmed up enough to clap whilst others (such as a gentlemen in the front) contents himself by gently nodding his head from side to side. It’s not exactly a show-stopping finale, but it has a certain charm. The Wheeltappers must have felt like something of a low-key booking for Springfield Revival after performing at the 1973 Academy Awards Ceremony. I don’t think that there’s ever quite been another variety show that makes the viewer think, “absolutely anyone might turn up in this”.